Many have described Magnified Healing energy as “soft yet powerful,” “magnetic,” “very yin” (or feminine) in its essence. Those who have experienced this beautiful energy feel uplifted, peaceful, connected to the Source / Creator and say it is gentle, loving, intense and works on a deep level. I would say it’s like feeling you are being wrapped up in a cuddly duvet, you feel held, nurtured and nourished as your heart opens and you connect on a deeper level to your soul and inner wisdom. Magnified Healing occurs through balancing the spiritual centers (the chakras) whilst directing the healing also the mental and emotional body, the physcial body as healing is directed to the endocrine system, lymphatic, metabolic, muscular systems, the central nervous system as well as the skeletal, respiratory and circulatory system. The beautiful thing with Magnified Healing is whatever stage you’re at on your journey, the energy meets you at that place and takes you to the next level! connect you to your heart and heal the emotions you hold there – grief, sadness, love, compassion etc. raise your consciousness awareness. What I like to call the ‘pause’. Instead of falling into old habits, you pause and from that place choose how to interact with the world around you. Magnified Healing establishes a constant flow of energy from the Heart to the Source, the All That Is, the Infinite Mind, down to the Diamond at the Center of the Earth. The link spirals and brings a deep state of grace pulsing forth from the Hierarchy, laying the very foundation for the Ascension Process. The first phase of Magnified Healing is a 5th dimensional healing energy. The healing modality was divinely transmitted through Revs. Kathryn Anderson and Gisèle King in 1992. As the Goddess of Compassion and Mercy, she performs her service of mercy and healing through love not through the merit of those who receive her gifts. Her flower and electronic pattern are the five-petalled lotus. Lord Buddha Gautama was her Enlightened Master. It is said that she maintained life in the body for one thousand years before ascending. Kwan Yin was “Chohan of the Seventh Ray” and “Keeper of the Violet Flame” for two thousand years until St. Germain succeeded her in 1954. 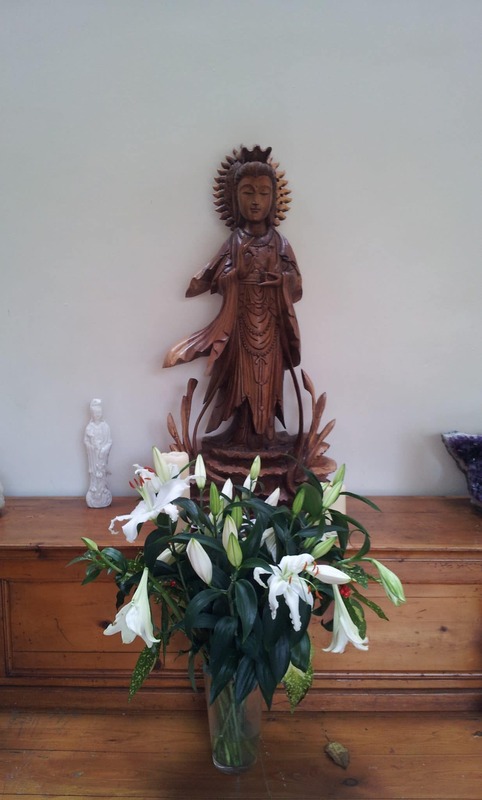 Magnified Healing has been brought down on Earth by Kwan Yin, the Chinese Goddess of Mercy and Forgiveness. Kwan Yin is known to Buddhists as Gwa Shin and Goddess Tara. In the 1980s Kwan Yin appeared in a vision to two Reiki Masters in the US; Katherine Andersen and Giselle King, and attuned them to very powerful healing energies. The healing power of this energy was a thousand times more powerful than Reiki, so Katherine and Giselle called this healing ‘Magnified Healing’. Being attuned to ‘Magnified Healing’ enables us to do everything we learned in Reiki, but deeper healing occurs at our emotional and mental levels. Since the cause of most diseases is at these levels of our personality, healing them results in the physical disease often vanishing. Magnified Healing was introduced to the Earth in 1983. Previously, this healing method was used only in the higher dimensions by the Ascended Masters to assist themselves, the Masters on Earth, and mankind under special divine dispensation. In 1992, under the direct intervention and inspiration of Lady Master Kwan Yin, Magnified Healing was brought forth into its expanded form for the advancement of Humanity and the Earth.